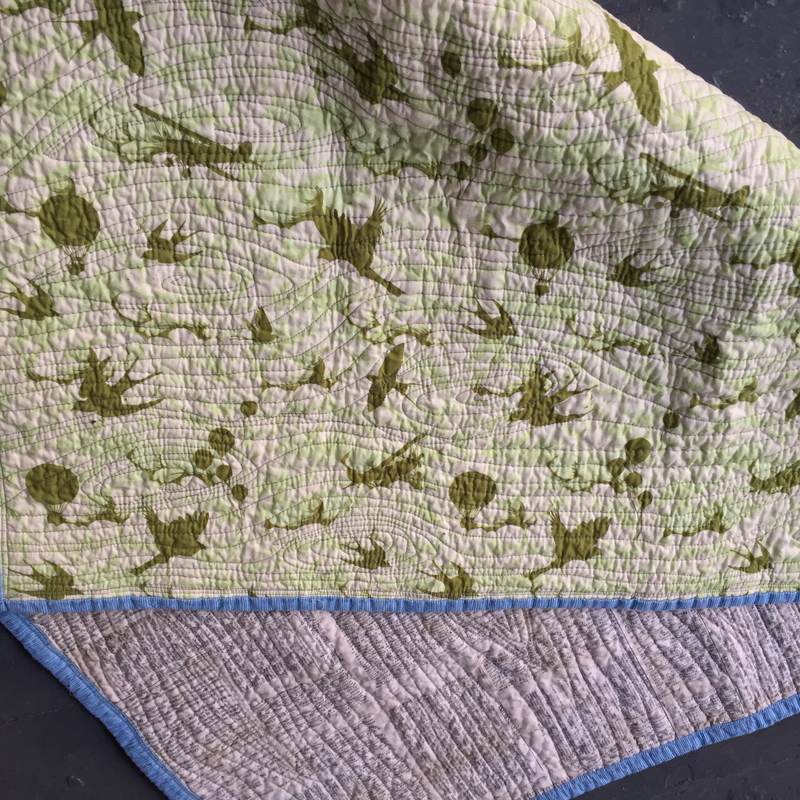 I needed a baby quilt STAT! for a friend at work. 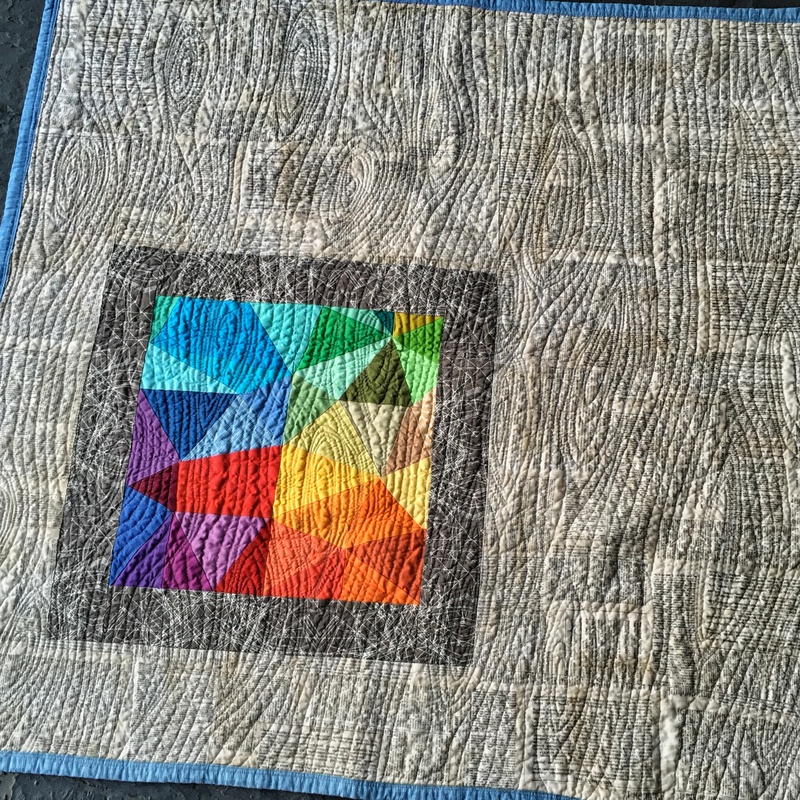 I had three days between when I decided I wanted to make the quilt and when the baby was due. Oy. I went with the old standby of squares and straight line quilting. I restrained my color palette to grey, aqua, beige, yellow, and b&w. When I type out all of those colors it doesn’t seem that restrained, but for me it is. I knew the quilt wouldn’t offer a lot in terms of design pop. so I dug deep in my stash for some of my cutest prints. 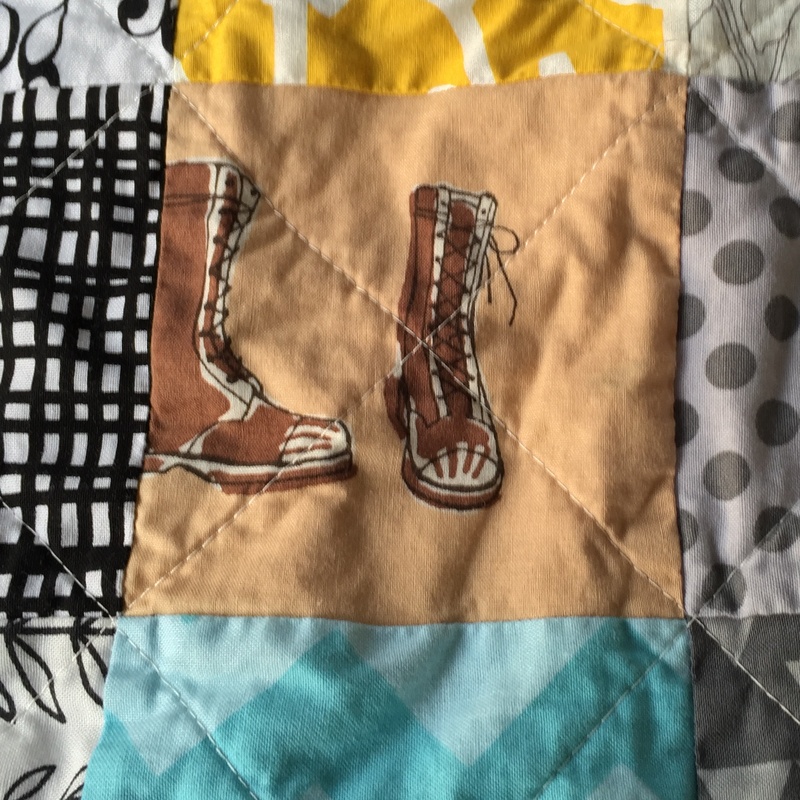 These adorable boots are totally stolen from how Rita used them in one of her baby quilts. She is a genius. I continued the cute print trend by using these cameras on the back. I cut the first night, took the second night off, and pieced, quilted and bound on a veeeery long third night. Not my best work, but I think my friend likes it. I took it out of the dryer and delivered to work her last day in the office. I am over deadlines for a bit. 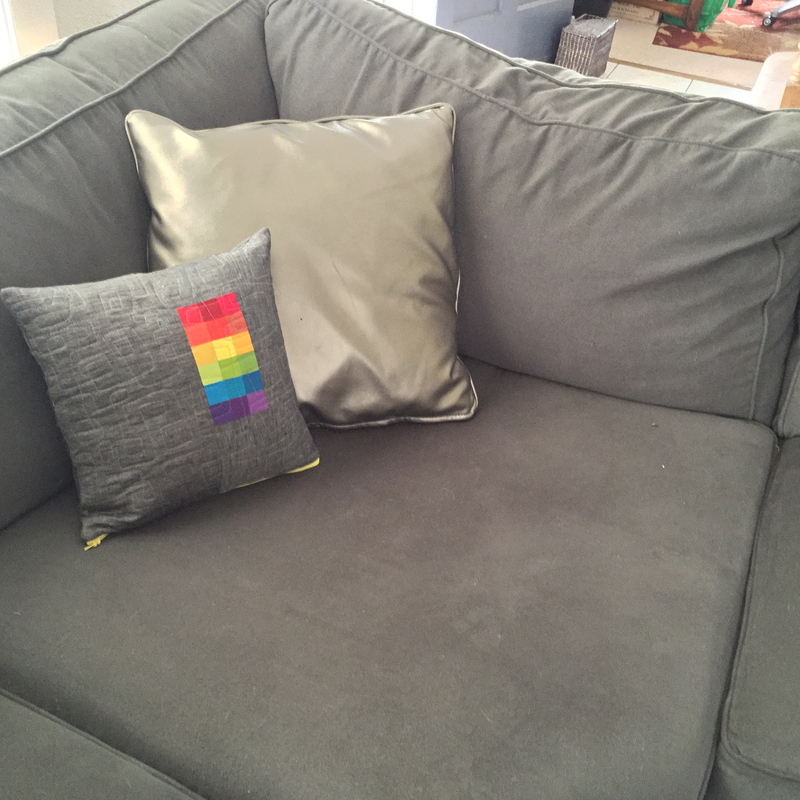 I made new pillows for our couch. Again. I think I might finally be happy with these. The last set I made were complex paper piece patterns that were fine enough, but I used a lot of beige linen and it just clashed with our dark grey couch. This time I used the perfect dark grey linen that blends beautifully. Sometimes I forget how nice blending can be. I used simple piecing and Kona solids and finished them with zippers. I am soooo over the overlap envelope closure for pillows. The flaps either don’t overlap enough and there is a gap at the back of the pillow OR they overlap too much and I risk ripping a seam to get the pillow in. The zippers really extended the time it took to make the pillows, but worth it. I also ironed on woven fusible interfacing onto the fabric at the back of the pillows which makes for a nicer finish. 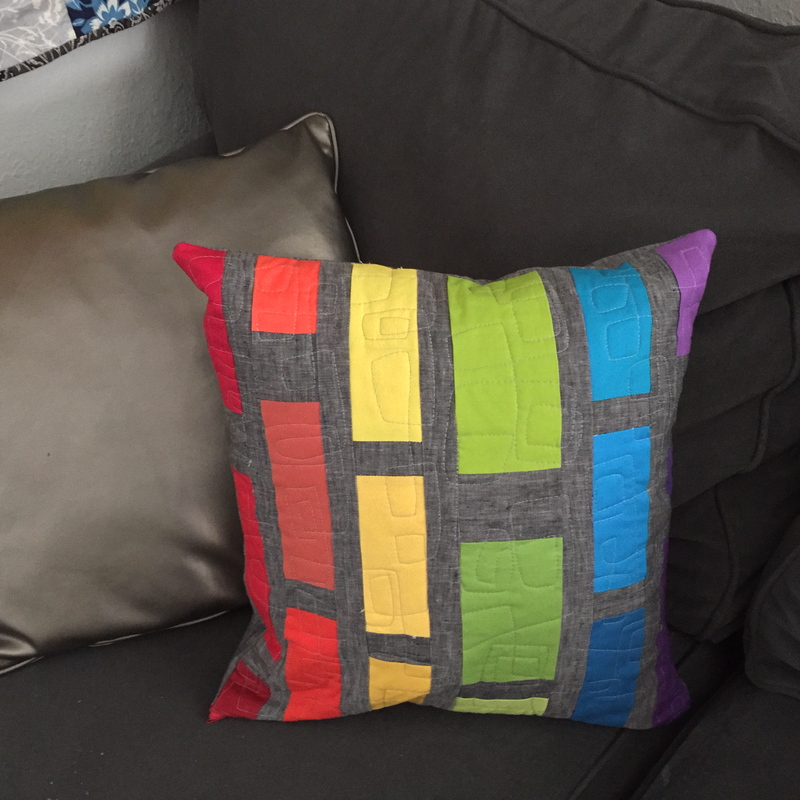 I quilted a sort of mod square/rectangle pattern. They are pretty mod looking, especially the one that looks like a row of lava lamps. 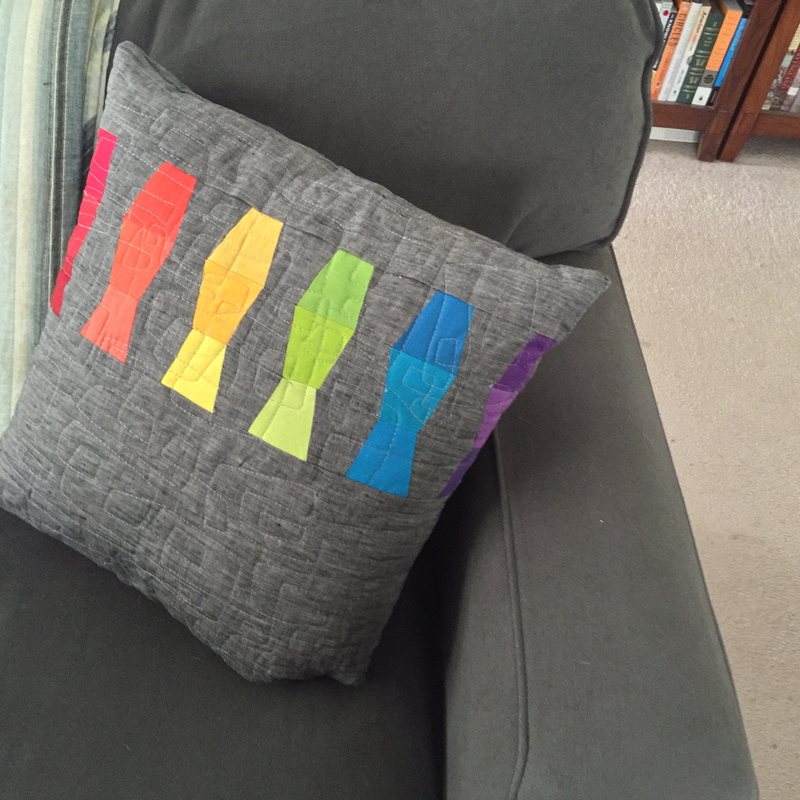 I really like them and so does the fam, so I may be able to relax with the pillow making for a few months. This is one of my favorite finishes ever. I am often loathe to start paper-piecing projects. They are such hard work. But I fell in love with this pattern by @jeliquits on instragram. I bought a layer cake and a charm pack of Kona solids and spent an hour identifying the colors to use. (I wanted this to be a gender neutral quilt so I avoided pinks – which is too bad because it ended up going to a baby girl, but oh well….) I am not really of fan of solids – there are so many fun patterned fabrics out there. For me, most of the fun is the fun fabrics. But in the past few months I have been moving from crazy prints to blenders to most of my last few projects relied heavily on solids. The outer border of this quilt is the fabulous Dictionary print by Tim Holtz. My favorite fabric ever. I luckily still have many yards. The inner border is a cool print by Katarina Rocella in her Indelible collection. I did a very dense woodgrain quilting pattern (I think this is the third or fourth time I have finished a quilt this way). I do love it – because of the end product and the fun of the process. I made the border extra wide using a blue Carolyn Friedlander print that is also one of the few patterned fabrics in the center bit. 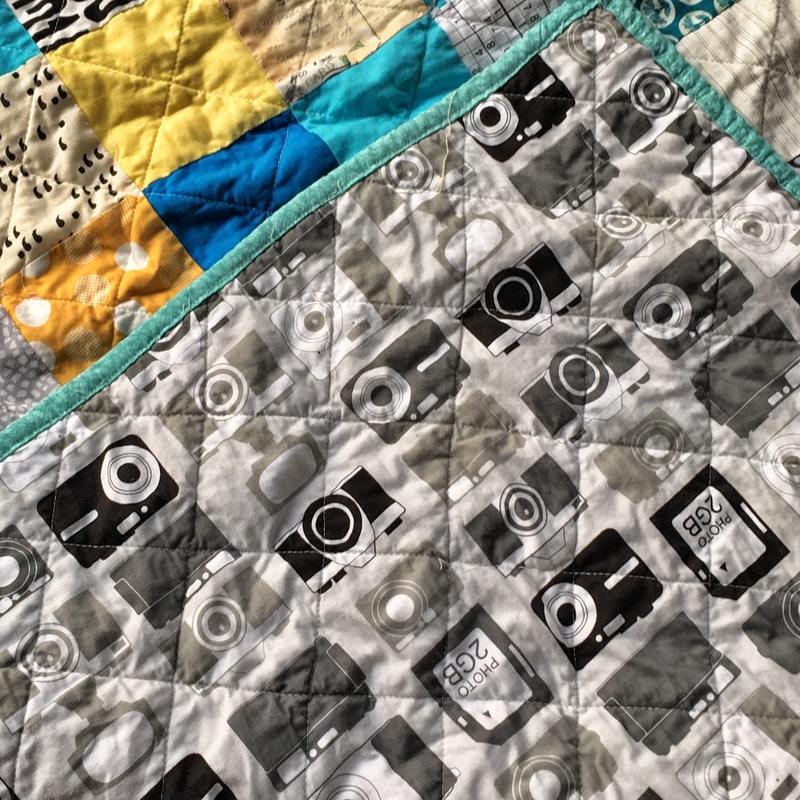 I backed the quilt with this sweet Tula print from her Bumble collection. So soft and sweet for a baby quilt. I delivered this quilt to work too late. The recipient started her maternity leave the day I got it there. It will be waiting for her when she returns. A few weeks ago I got a horrible cold, possibly flu. I had a fever – does that make it the flu? A temporary bump full of manageable misery. I took a sick day. I hate sick days – they make me feel anxious. The next day I had a new job (same company, new job). And things have been going really quickly since that. Wrapping up old job responsibilities, trying to learn everything about the new job on-the-fly. It has been exciting and it has made me pretty unhappy. I am trying not to be unhappy. I am trying to be excited for the new opportunity and stretch and to gladly take the blame for things that happened before I started this new job. Are people allowed to be unhappy anymore? Since we discovered that it is the unhappiness that is making us unhappy, what am I to do? I know it is so gauche to complain in 2015, but gosh, how I want to. Tuesday night I cried. It got really bad and I cried. Like a teenage girl. I sobbed – probably a better descriptor. There is this knot in my chest that I can’t get rid of. A ball of anxiety that just sits there. A constantly-on processor of all that is going wrong and can go wrong. Writing drafts of the things I cannot say. Calculating how much money is needed until my next paycheck and how much we have. I am unhappy. 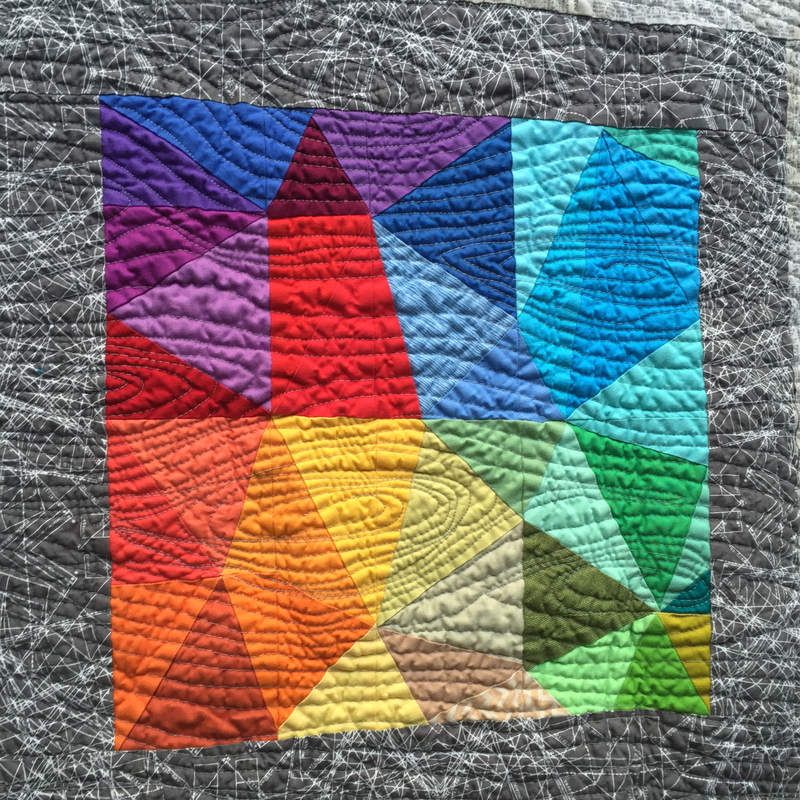 I went to a quilt retreat this weekend. It was really excellent and I may even have some tiny germs of new friendships. But I realized how poor my sewing skills are. How much I have to learn. It really shouldn’t add to my unhappiness, I have to just remind myself it is the third thing. But the beauty and precision and evident skill of others and their work got me down a bit. Even when I slowed down and pressed seams open and concentrated on cutting accurately, my work fell short. My points weren’t pointy, my blocks were just shy of 8.5″ square. I told jealousy to go away and let inspiration in. Jealousy sort of behaved. And after writing all that, I see why being unhappy and talking about it is so passe in 2015. Stand up, dust off, move on. Only work and time fixes things. That’s it. There is no other formula ever. There is no money coming from the sky, there is no pill to take, there is no brilliant flash of insight. Work and time. It is the only balm, or at least the only one I have. And I am so lucky that those will fix my “problems”. And so there will be no further reports of my unhappiness in the near future. Thank you for the indulgence.